This review was originally written for Subtitled Online (now sadly closed) July 2010. It was my first full film review to be published online. Environmentalism, war and peace, pride and corruption, coming of age and redemption – it can only be a fairytale from acclaimed Japanese animation director Hayao Miyazaki and his animation studio powerhouse Studio Ghibli. Sophie Hatter (Chieko Baisho) leads an unremarkable and tedious life – a hatter by trade (as well as by name), she spends day after day making piles of fashionable headwear to keep her late father’s business going. One day, she is rescued from the advances of two soldiers by the mysterious wizard Howl (Takuya Kimura), and is unwittingly caught up in the handsome young wizard’s affairs, as they both escape the minions of the sinister Witch of the Waste (Akihiro Miwa), who is determined to gain Howl’s power for her own. The Witch pays Sophie a visit at her shop and puts a curse on her – Sophie ages drastically in moments and is unable to tell anyone what has been done to her. So, scared and confused, she flees her home town and ventures forth into the wilderness, finding her way into Howl’s castle – in reality a bizarre walking pile of assorted architecture, landscape features and junk made sentient by a fire demon named Calcifer (Tatsuya Gashûin). The great thing about HOWL’S MOVING CASTLE is that we are given the opportunity to appreciate the beauty of every single frame of animation. Because of the relatively slow pace of the film, we can really take in the quality of the imagery – we are given time to simply look when too often in modern cinema are we thrown in at the deep end, rushed, and left disorientated. The animation moves from stunningly rendered dreamy landscapes to the strikingly weird and captivating movements of the castle itself, and the nightmarishly apocalyptic battlefield panoramas. Sophie is an extremely likeable heroine. You really empathise with her magical entrapment, and Chieko Baisho’s ability to portray the character in both her young and old forms is a true testament to her skill as a voice actress. Over time she overcomes her demons and finds newfound confidence in herself – she matures internally as well as externally, and in essence, her curse sets her free. Howl is far less engaging (at least, at first) – he appears arrogant, selfish and cowardly, and even his boyish charm can’t endear him to you. However, once his back-story is fleshed out, you can’t help but feel pity for him, as he’s just a lost soul. The villains, quite typically for a Miyazaki film, aren’t really very evil, rather they have lost their way and are in need of redemption. The real battle, for all the characters, is within themselves. Miyazaki’s regular collaborator, Joe Hisaishi scores the film, and the soundtrack is simple yet effective. It is quite staggering how Hisaishi can bring a tear to your eye with a couple of well placed notes. The score sounds a lot like a lullaby, and whilst it may have the power to send young children to sleep, it stirs entirely other emotions in adults – it causes you to reminisce, to remember happier times when the world was so much simpler. 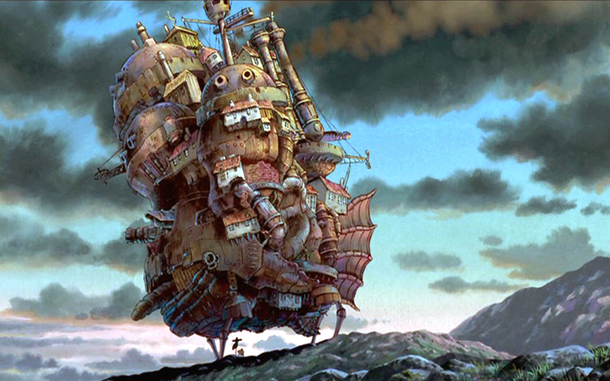 About three quarters of Howl’s Moving Castle is quite simply flawless. The last half hour or so, however, disappoints slightly – losing some of the overall magic. The story, while never completely watertight, is entertaining for most of the film, but drifts into nonsensical in the last act, and the final revelations about Howl’s past are a little underwhelming. The film as a whole feels slightly too long. This entry was posted in Film, Film Review, Subtitled Online and tagged Animation, Chieko Baisho, Film, Hayao Miyazaki, Movies, Studio Ghibli, Takuya Kimura, World Cinema. Bookmark the permalink.